The World Retail Congress is an organisation bringing together industry leading global retailers. From the established market leaders to fresh new start-ups, Congress gathers the most innovative and exciting names in the retail world to discuss developments and progress. Jonckers is proud to have been invited to attend and exhibit at the World Retail Congress Tokyo gathering this week, to discuss the fast changing ecommerce and retail landscape and how dynamic, evolving and focussed innovation is helping the sector evolve. For the next three days, the Congress provides an unrivalled high-level forum for suppliers and retail leaders to meet and share insight, form powerful connections and to help shape the retail future. Our new APAC Business Unit Director Joseph Gabriella is heading up the team attending the event. Their aim is to discuss the ever increasing requirement for localization and globalization in the retail industry. Consumer and customer needs start firstly with communication. Recent studies show that 72% of global consumers spend the majority of their time on ‘own language’ websites. * This high percentage of international online usage has prompted retailers worldwide to take action and enhance their own websites, apps and consumer platforms using translation services. The rapid growth in online consumerism over the last ten years comes as no surprise. More and more people are choosing to take the easy option in ordering goods via the internet, however, the need for localization reaches much further than just translating websites. Marketing and sales campaigns for products and goods, customer service documentation, terms and conditions, the list continues. The localization of retail material is becoming a vital part of major global organisations marketing strategies. The need and want to communicate their services and products on a multi-national scale is at an all time high and with LSP’s such as Jonckers available to offer instant assistance, companies are finding their products going to market worldwide at a rapid rate. Joseph and the team will be discussing major developments in NMT (Neural Machine Translation), Transcreation Services and our custom designed WordsOnline platform, all of which are perfectly geared towards increasing exposure, efficiency and delivery across multiple industries, but work especially well in the retail and ecommerce sector. 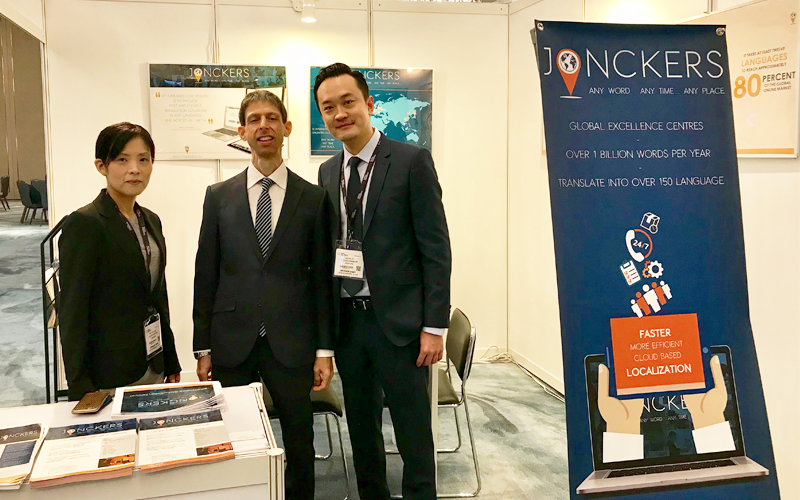 Our technology combined with personal service place Jonckers as perfect partners for retailers to explore localization options for global expansion.